Karen Glass sees beauty—and even luxury—in scraps. Over her 40 years in the fashion industry (she’s the former vice president of design and product development for Chico’s), Glass has collected pieces of fine fabric from mills, flea markets, and sample rooms around the world. Now with her new Atlanta-based clothing line, Zerowaste, Glass is using those scraps to create intricate and unique womenswear. In building a fashion company that squanders nothing, Glass hopes to promote luxury clothing that is rich and indulgent while also being environmentally and socially conscious. Zerowaste launches in November with three collections: a line of button-down shirts, T-shirts, jeans, and jackets reconstructed from men’s clothes; a selection of cozy knits; and the “archive” pieces created using the most special, high-end textiles from Glass’s library. “She needs an understanding of what goes into fashion,” says Glass of her ideal customer. “She’s going to live a conscious lifestyle.” She’s also going to need a substantial wardrobe budget; T-shirts start at $90 and archive pieces at $4,000. 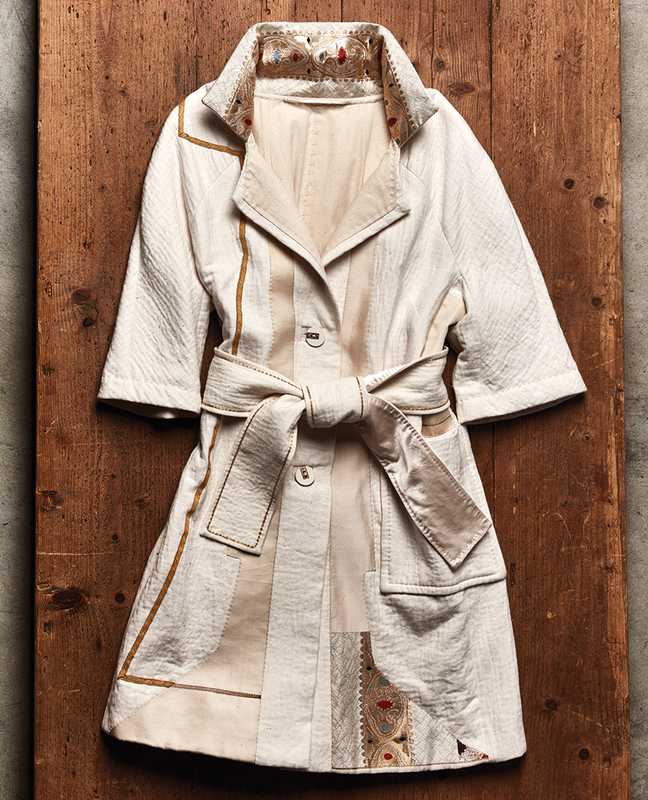 The jacket is lined with a muslin that’s typically used for fitting silhouettes. Tiny imperfections on the back become opportunities for adornment, like patterns in gold thread. The porcelain buttons were crafted by Rachel K. Garceau. The metal adornment is by Billie Hilliard. All are handmade at the Goat Farm. Glass handpicked the gold trim at the Clignancourt flea market in Paris and from remnants found in Italy. The base cloth is organic cotton from a factory in Rajasthan. This piece was created by five sets of hands over approximately 100 hours. The sash is silk peau de soie left over from Glass’s reconstruction of a vintage wedding dress. Glass found the obi fabric on her travels. This piece is the second cut; the cloth was applied to four pieces total.